Richard is currently living in Estero with his wife Cynthia. They have one daughter, Suzanne, and three grandchildren, Chris, Kyle, and Lauren, in Long Island, New York. He grew up in Valley Stream Long Island and graduated from Hewlett High School. He attended Nassau Community College, and Hofstra University graduating with a BBA degree. After serving in the United States Army during the Vietnam War, he received an MBA degree from St. John’s University. Richard worked for the Navy Exchange Program for 17 years, head quartered in Brooklyn and Staten Island, N.Y., and was the Banking Manager when he left, to move to Vermont, where he owned a motel, and was the Comptroller for seven school districts for ten years. 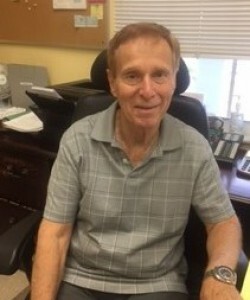 Upon relocating to Florida he joined the Lee County Tax Collector’s Office as the Accounting Director and retired in September 2014 after sixteen years. While living on Long Island he ran four New York marathons, and two Long Island marathons. He enjoys playing golf and bocce. As Finance Assistant Richard handles Contributions, deposits, payables, payroll, managing our financial record keeping, and much more.